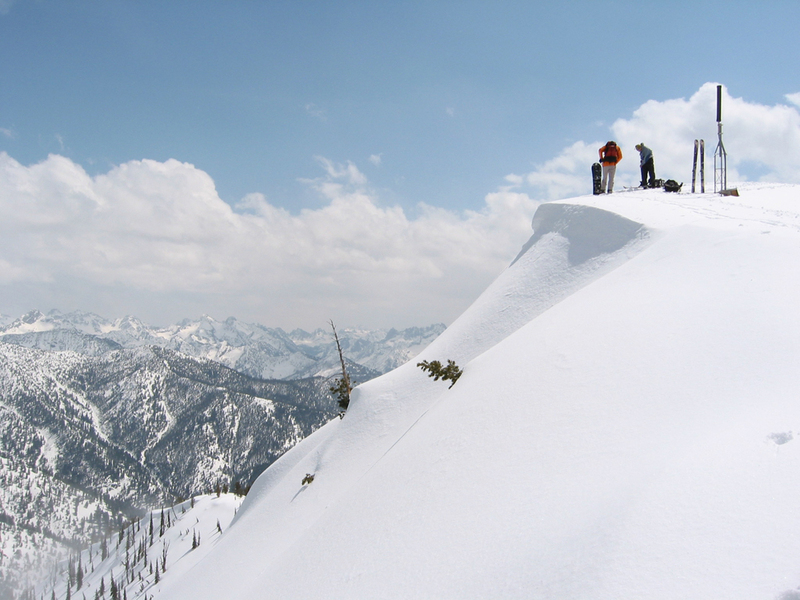 We ski up a seldom-climbed peak, with turns on the return. The weather report didn't look too favorable, especially in the Lost Rivers... so we chose something closer to home. Zumwalt had been on my list for a while as sort of a curiosity. We could see it from Copper last weekend, so it was fresh in my mind. Bob wanted to give it a go, because we had seen a big NE face. Art was a little less enthusiastic, but agreed anyway. So we left Boise at a leisurely 6:30 am for the Grandjean turnoff. After a little highway scouting for a route Bob had heard of, we returned to the Grandjean turnoff, parked, and saddled up. We left the car at 9:15. 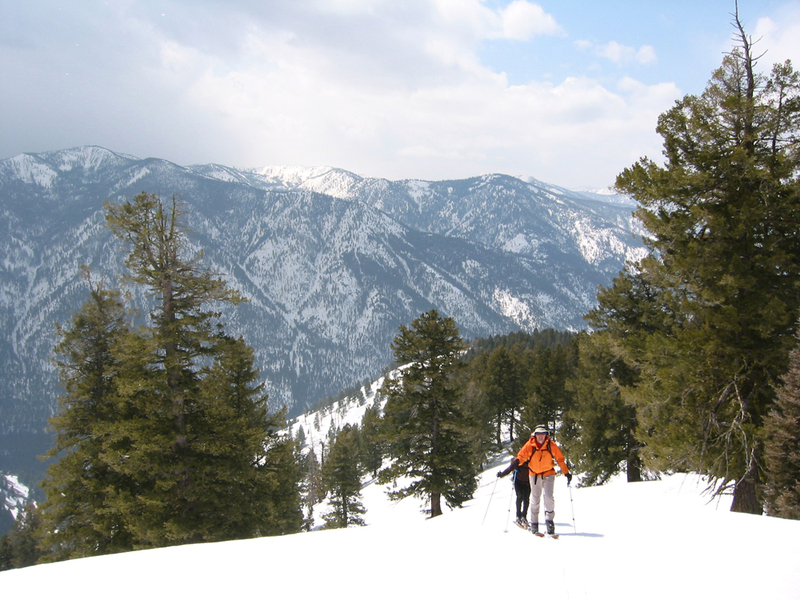 The first part of the route involves skiing the road for about 1.5 miles until you cross the bridge over Canyon Creek. Then its straight up the ridge. As we moved off the initially bare hillside onto consistent snow, we were a little surprised and dismayed at seeing tracks, probably a week or three old. Both ski tracks, and snowmobiles. The nerve of some people. 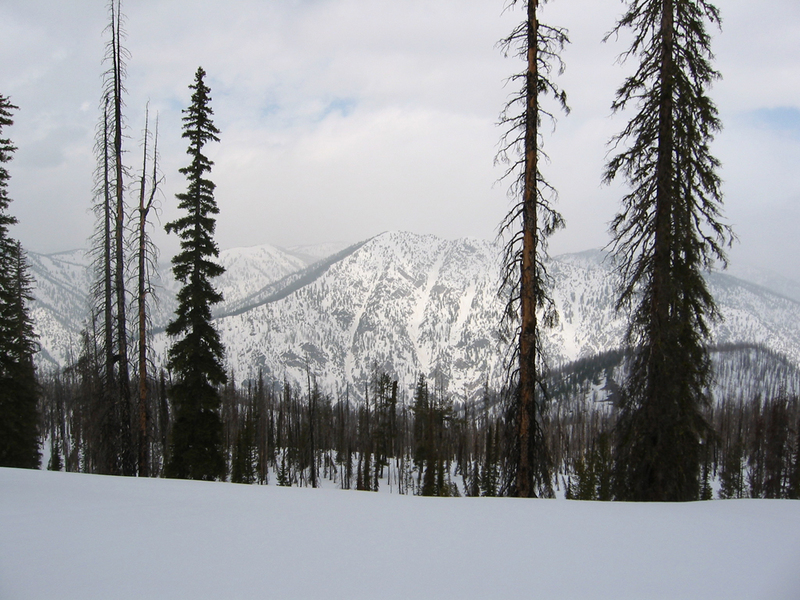 The lower part of the ridge is forested, so there isn't a lot to see. 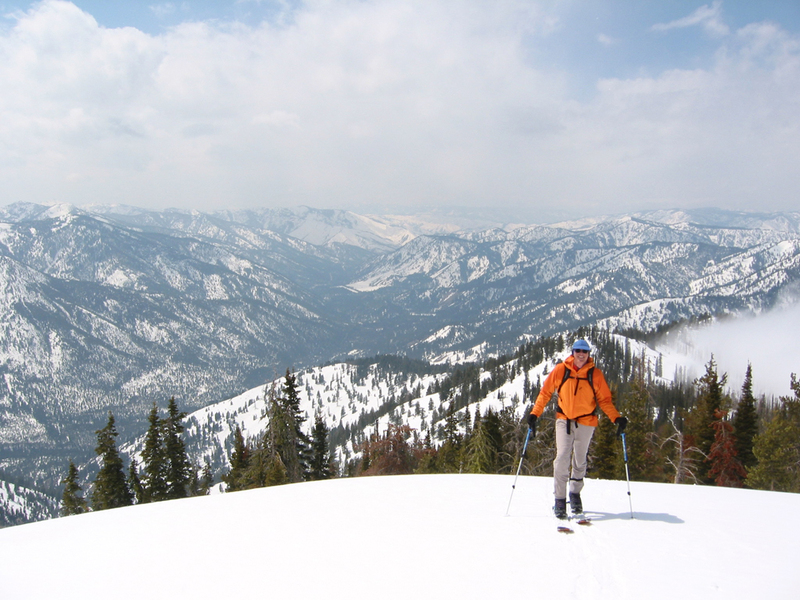 We walked up about the first 1000', then switched to skis. Most of the slope was a good angle for going straight up, so progress improved. After about 2.5 hours, we had gained enough elevation to finally see our objective, the peak hidden by the right-most tree. After a quick lunch, we were back on the march. The weather-guessers had predicted warmer temperatures (warmer for this area, not for Boise) and a 60% chance of snow. They were at least partially correct. On several occasions, we were enveloped in violent squalls with heavy snow. At least for a few minutes. But as you can see, we also got some sunshine in the deal. 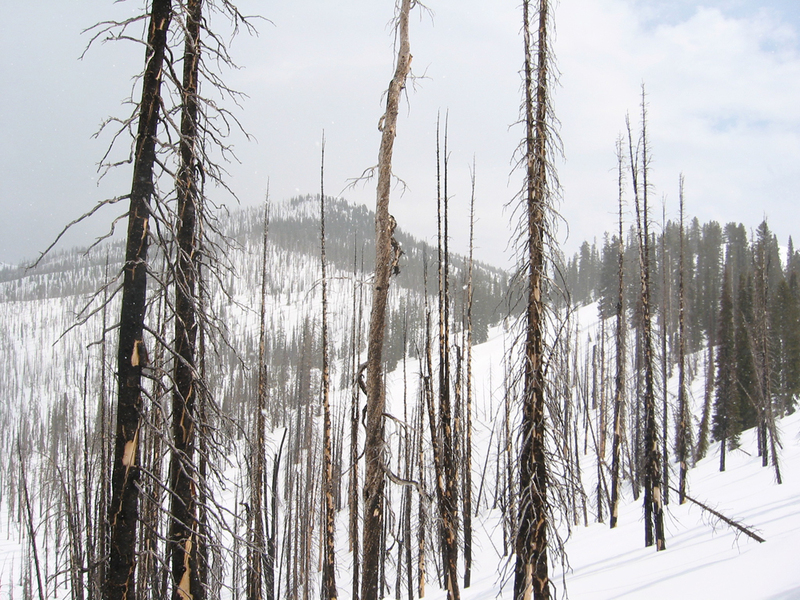 At around 3500' of gain, the ridge makes a turn to the north-east and enters the burn that you see from the highway in Canyon Creek. At this point, the summit is not far off. Speaking of Canyon Creek, this is the peak that initiates all the avalanches. Click for a bigger version that shows the slide chutes, etc. Note the darkness in the foreground- here comes another squall. The wind was howling and it started to snow again. I was concerned that we were going to summit and not see a thing. But with about 100' to go, the sky popped open. Note the fog bank recediing from the ridge just to the right of Bob. 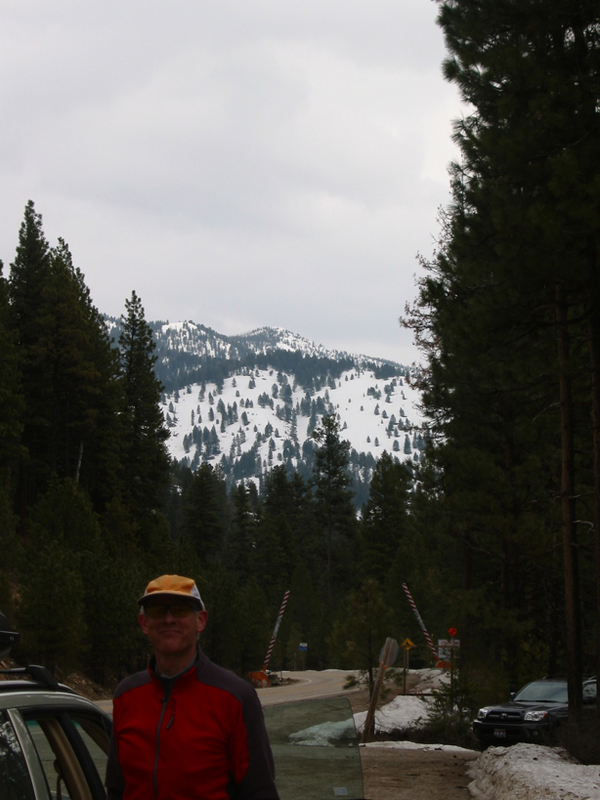 That's the South Fork of the Payette behind Bob, looking toward Lowman. The summit is a big flat space, at least when covered with snow. It took us about 4 1/4 hours to get here, but it was worth it. And as the clouds danced about, they gave us some really great views from a cool, new perspective. Bob, true to his nature, had to jump off the steep NE face. I decided that I needed to save my strength, so Art and I stayed on top, and relaxed and stared. 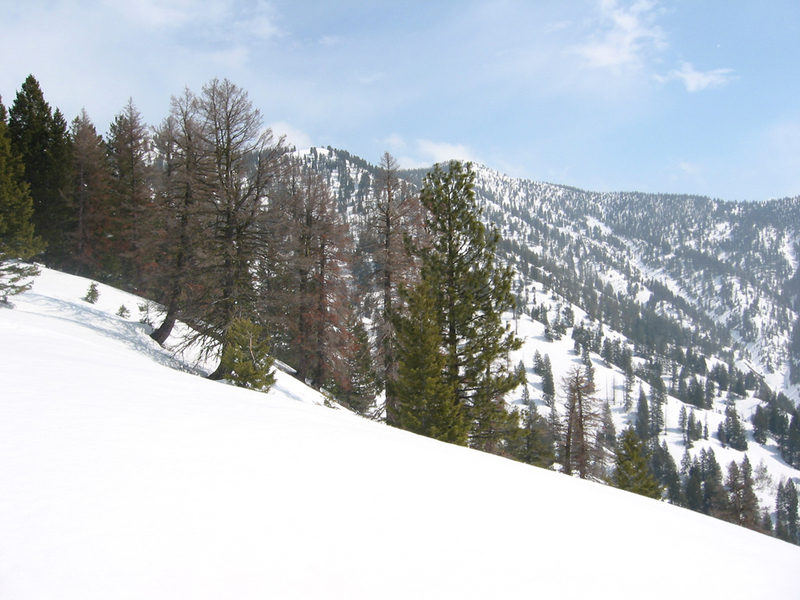 The ribbon of white in the forest somewhat left of center is Highway 21 going up Canyon Creek toward Banner Summit. And the white summit just right of center is Copper Mountain. I have no idea what that thing on the left foreground is, but it is solar powered. This gives some perspective on the slope that Bob was about to hop off. Unfortunately, the photographer totally blew the descent sequence. But while we waited for Bob to skin back up, we enjoyed the views. 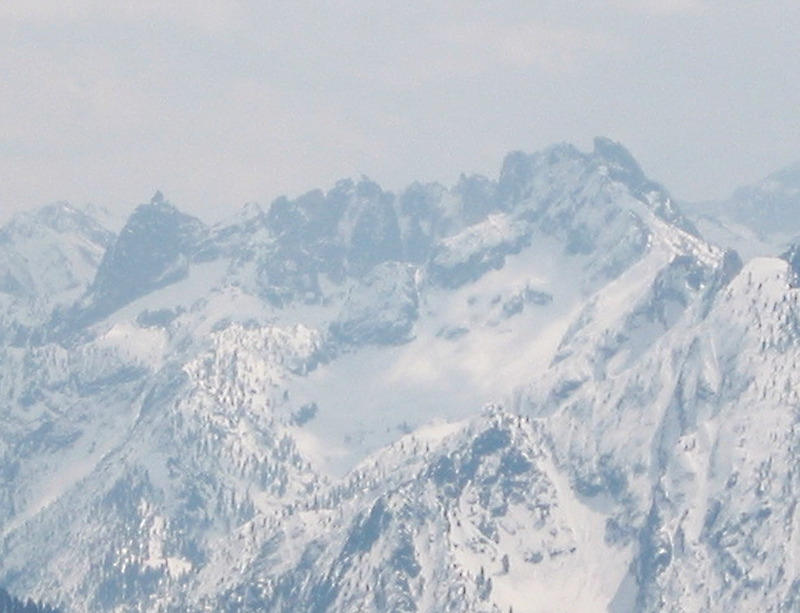 This is a zoom of the Monte Verita group, with Baron Spire on the left and Warbonnet on the right. After 45 minutes on top, it was time to head down.The descent was fun, but challenging. The snow was really sticky, and in places hid surprise holes. So Art and I picked our way down on our skis, while Bob whooped it up on his snowboard. Bob found our diversity of gear entertaining- I was on heavy, metal-edge tele skis, he was on a split board, and Art was on old, wood Bonna 2400s. Here Art shows us classic tele technique. We hit the road along the river and mushed back to the car, where we could confirm that you can see Zumwalt from the road-- the high point centered in the picture.